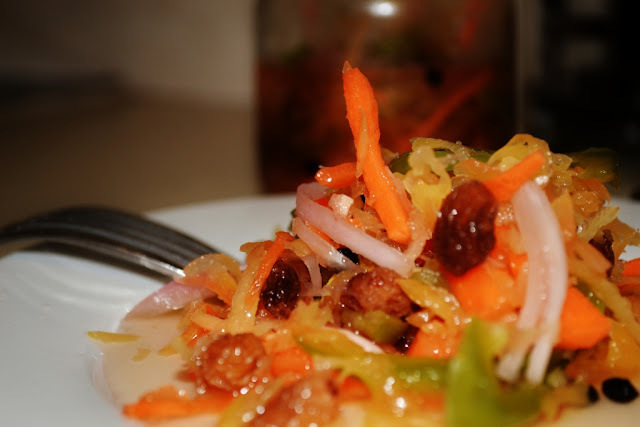 This Indian-influenced relish is a favorite in the Philippines. Served as a side dish to accompany fried and broiled fish or meat. 1 Peel and grate the papaya into thin strips. Place the strips in a muslin cloth and squeeze out as much of the water from the papaya as possible. Then place the strips on a wide platter to dry in the sun. 2 Bring the vinegar, sugar and salt to a boil in a large saucepan. Add the papaya strips and simmer for 5 minutes. 3 Add the rest of the ingredients and stir to mix. Cover the saucepan, turn off the heat and set aside to cool. 4 Transfer the cooled pickles to a sterilized jar or bottle. Keeps for a month in the refrigerator.